The idea of pilgrimage has long fascinated me – leaving behind the familiar to venture forth on an essentially spiritual journey. The spiritual pilgrimage was all the rage during the medieval period in western Europe. In England, the most popular pilgrim destination was, by far, the shrine of St. Thomas Becket at the Cathedral of Christ Church in Canterbury. In fact, I couldn’t resist having one of the characters from my book, Resurrection, make such a pilgrimage on his way home from France. Sadly, the popularity of the pilgrimage in England was dealt a fatal blow by Henry VIII’s suppression of the monasteries between 1536 and 1541. 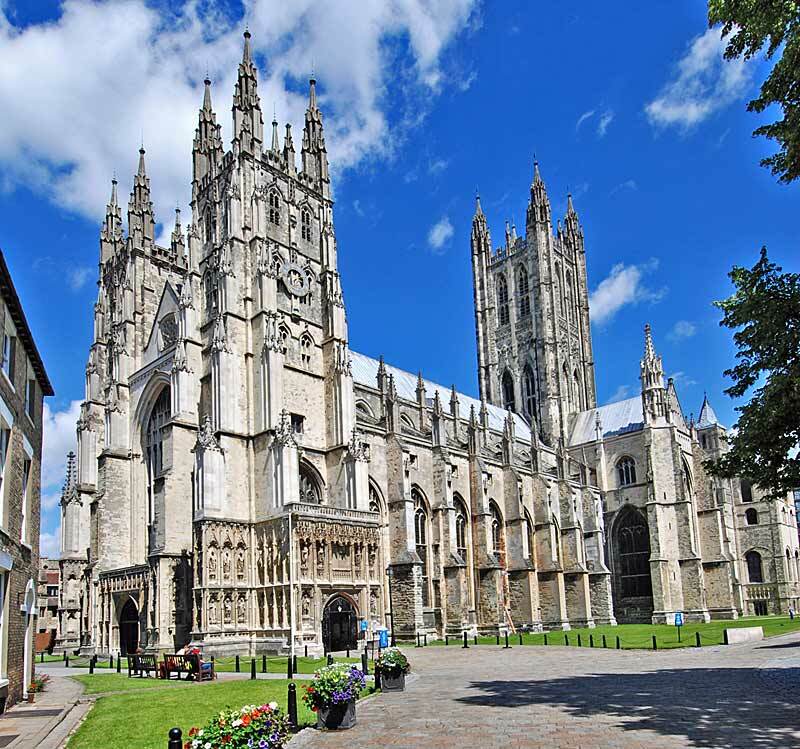 But in its heyday, after Becket’s canonization as a saint in 1173, the cathedral in Canterbury became one of the richest pilgrim sites in all of Christendom. This is evidenced by the enormous and expensive building programs that were carried on there during the period, much of which can still be seen today. Saint Thomas, the Chancellor of England before his appointment as the Archbishop of Canterbury, had been murdered in the cathedral in 1170 by knights loyal to Henry II. Within a week of his death the first miracle had occurred. A paralyzed woman had been cured instantly by drinking water tinged with Becket’s blood. Many others were to follow and soon the healing powers of the martyr’s blood were renowned throughout England. Pilgrims flocked from across the kingdom and throughout Europe. These pilgrims had a strong desire to bring something back with them as a token of their experience. It is almost certain that many of them also believed that such tokens, having touched or been in close proximity to the holy relics contained in the shrine, carried a spiritual power of their own – a sort of secondary relic, as it were. To avoid the temptation of dismantling the shrines piece by tiny piece, the church sanctioned the production of commemorative badges that pilgrims could purchase. They were proof that a pilgrim had been where he said he had been and would be displayed by either pinning or sewing them to the pilgrim’s hat or cloak. As a general rule, English badges tended to have a metal pin integrated into the back of the badge, while those from the continent usually had small loops at the corners which could be sewn onto clothing. The earliest badges probably took the form of tiny lead ampullae; little containers in which holy water could be stored, designed to be worn around the neck. But because these were difficult to manufacture and provided little scope for artistic diversity, by the 14th century a vast array of intricate designs were in production. Records have shown that the most popular shrines could sell in excess of 100,000 badges annually, making pilgrim badges the first commercially mass produced tourist souvenirs in the world. Think of that cheesy gold-painted replica of the Eiffel Tower hidden away in your closet or junk drawer. I’ll bet you didn’t know that it had such a pious ancestry. 1) Becket’s Sword – represents the sword that killed Becket and was on display in the cathedral. The badge is quite elaborate and the sword can actually be removed from the scabbard. 2) Becket’s Death – a representation of Becket’s martyrdom at the hands of knights loyal to Henry II. 3) & 4) Ampullae – both are pewter ampullae containing “Canterbury Water”; water taken from the well in which the blood and brains of the martyr scraped from the cathedral floor were deposited. The top example is in the shape of the large oriel window in the chapel shrine, while the lower is in the form of a scallop shell decorated with a bust of St. Thomas on one side. 5) The Shrine of St. Thomas – a detailed replica of the actual shrine housed in the Trinity Chapel containing the saint’s headless body. The lower half of the head was in another shrine in the cathedral crypt and the top of the skull was in a small reliquary in a separate chapel on the site. 6) Bust of St. Thomas – a representation of St. Thomas in his ecclesiastical vestments. It is interesting to note that the vast majority of medieval pilgrim badges that have survived have been recovered from bridge sites along major waterways. It seems to suggest that they were deliberately placed there for some votive purpose; similar to our current practice of tossing coins into a fountain. Whatever the case, it is clear that pilgrim badges were an indispensable part of the medieval pilgrimage experience and can give us a tantalizing glimpse into the minds of medieval pilgrims. If you are interested, there are several modern manufacturers of very fine reproduction pewter pilgrim badges. The ones I have listed below produce some very accurate representations of actual surviving examples. This entry was posted in Faith, History and tagged author, canterbury, pilgrim badges, pilgrimage, thomas becket, writer. Bookmark the permalink.